I am so happy to be back on this very special island and fortunate to be based here until the middle of May. The weather is gorgeous; the holiday decorations are especially eye-catching, the yachts line both sides of the harbor (except when they had to leave for three days due to a sizable houle (large swells) and the festivities are in full swing. 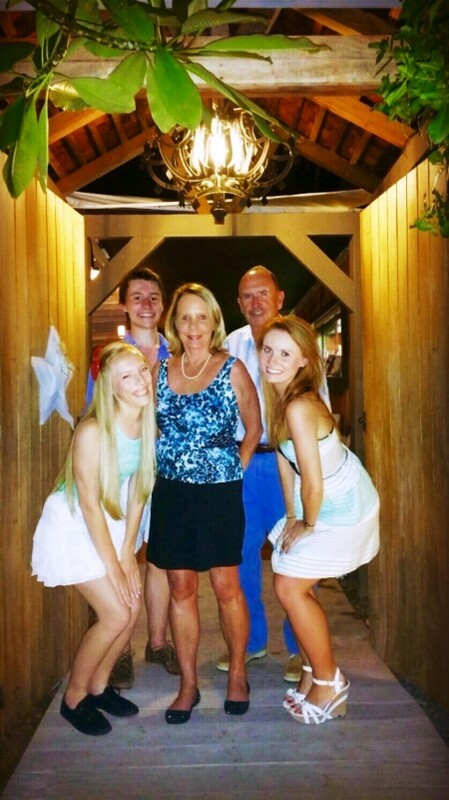 I am lucky to have some of my family visiting us (my son, Mark Smyth, his wife Cynthia and their three children, Reegan, Lilia, and Nate); we are enjoying the beach, the restaurants, and the vibe. Can you guess where this photo was taken? On Christmas Day, we went to St. Jean beach. 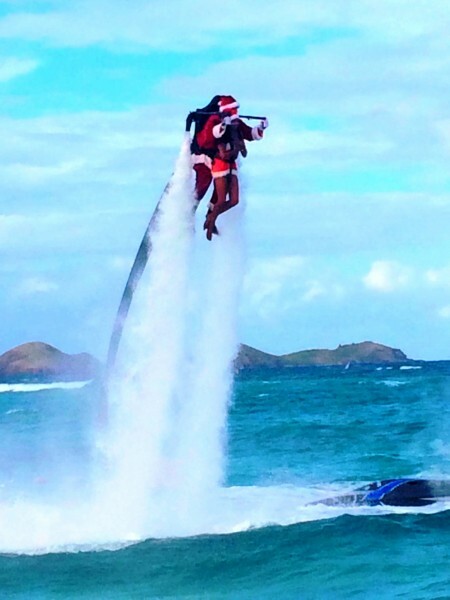 Santa and his helper improvised his sleigh and arrived by H2O Jet Pack! Do you want to try it? We can book it for you. 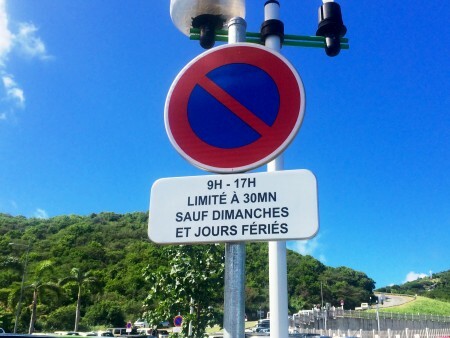 For those of you who have been to St. Barth before, you will notice some signs (in French, however) indicating a 30 minute parking restriction Monday through Saturday between 9:00 a.m. and 5:00 p.m. in the lot at the Gustav III airport. I observed that the “parking patrol” was at-the-ready to give out tickets. 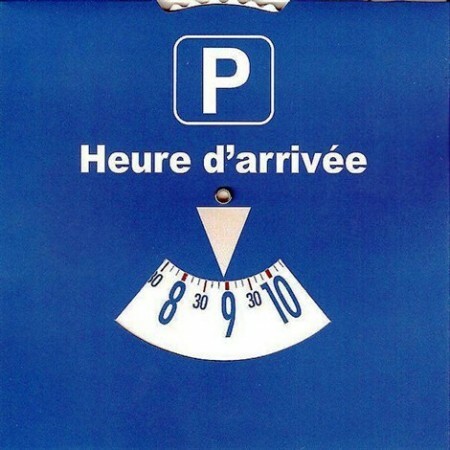 Be sure to use your “Blue Disk” specifying the time you arrived on the face of the clock. The disk should be found in your rental car. What if you need to park for a longer period? 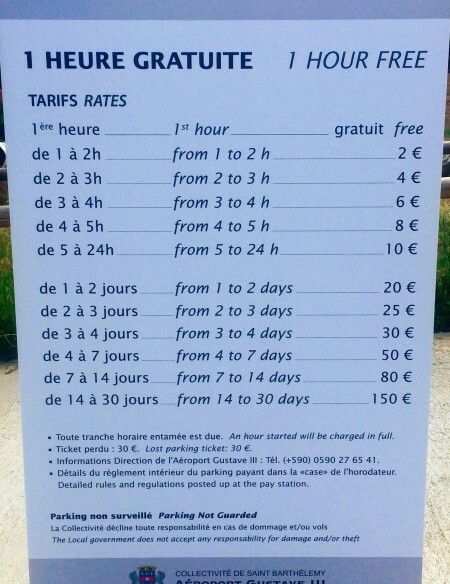 The Collectivité bought the lot across the street and has instituted St. Barth’s first paid parking lot. The good part is that the first hour is free; I don’t think that most of you will need more than an hour to do your thing at the airport, so to me, it’s a good solution. 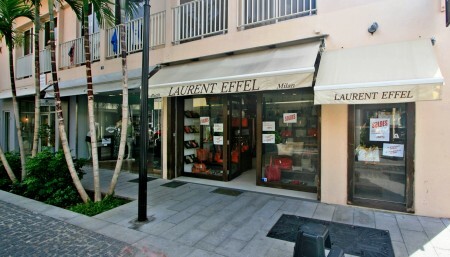 For the areas in Gustavia look for the signs and use your disk. The island has added parking limits in the lot by the yachts and the ferry dock, too. The Gustavia limit remains at 90 minutes. Enforcement is between 8:00 a.m. and 6:00 p.m. Monday through Saturday. I love to try the new restaurants so that I can report to you. Steve and I have already managed to dine at two of them. The first one, Avventura is located in Gustavia across the street from Eddy’s and on the same side of the street as Black Ginger. In years past, it was called the Sapotillier, B-4 and Ocean. They bill themselves as a ristorante/pizzeria but they also have some nice more traditional items including meat and fish dishes. 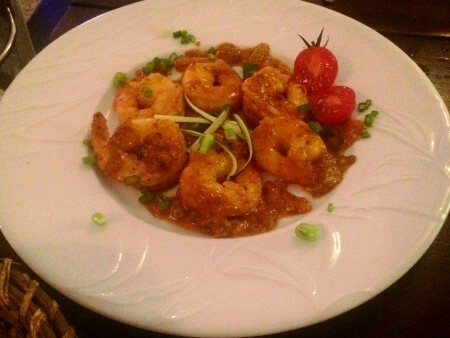 We enjoyed sharing the Queues de crevette au saté appetizer. The pizza prices range from 10 to 22 euros. 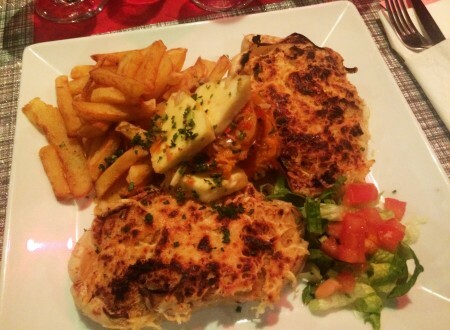 The other restaurant that we were able to try is L’Escale d’Avriette; it is located on the other side (La Pointe side) of the harbor in the space where Harbours used to be. 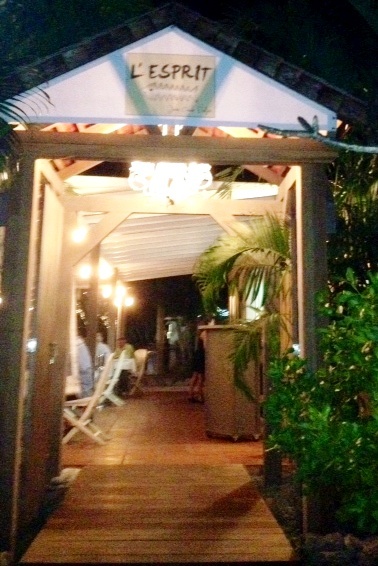 It’s a Créole restaurant with a harbor view that is owned by a St. Barth family and named after their mother, Avriette. When I first set foot on St Barth in 1986, I was introduced to the stuffed Christophine at the now long gone Marigot Bay Club restaurant that was run by Michele Ledée, an affable man who was born in St. Barth. 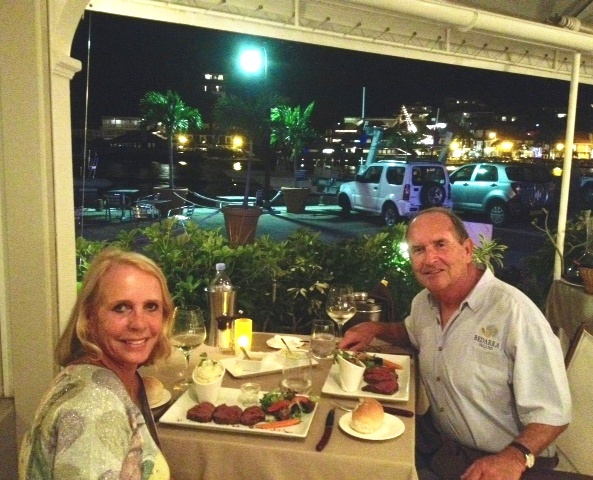 At the time, it was my favorite restaurant; the food and view were wonderful. I also enjoyed watching a handsome young waiter put on his bathing suit, swim out to the lobster trap that had been sunk in the bay, pick the langoustes that his patrons had just ordered for dinner, swim back, and quickly change into his clothes again. (Sorry for the walk down memory lane…) Anyway, I was thrilled to see the stuffed Christophine on the menu because so many restaurants have stopped serving it as it takes a lot of time to prepare. It is a type of squash and has flesh that is scraped out, mixed with langouste and vegetables, then re-stuffed into the shell, topped with cheese and grilled to perfection. Try it and let me know if you like it. 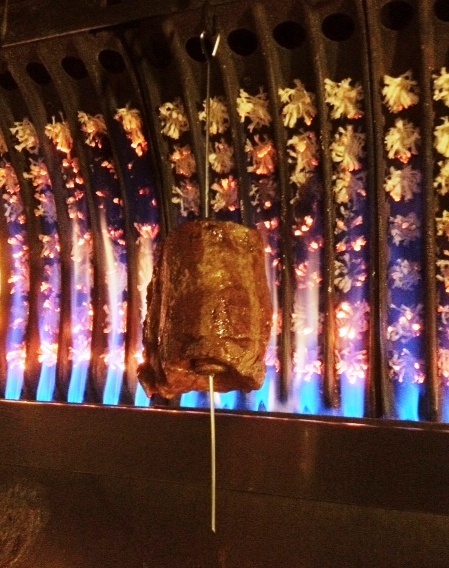 We are gearing up for New Year’s Eve and I hope you are too. 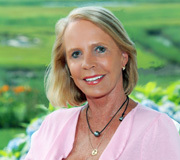 I’ll keep you posted on the latest happenings on your favorite island.